Azerbaijan National Art Museum has a special surprise for kids this winter. 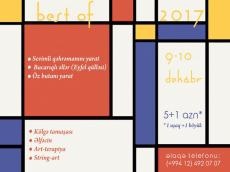 The program "Best of 2017" awaits little guests on December 9-10, Azertac reported. During the event, kids will enjoy fascinating entertainment program. Young visitors have a chance to create their own heroes, paisley pattern and even the symbol of Paris Eiffel Tower. Moreover, little visitors will join art therapy, useful treatment tool for kids. Ticket price is totally 6 manats ($3) for one kid and one adult. The Azerbaijan National Art Museum is a treasure house that preserves the national moral values and cultural heritage. This treasure house, holding more than 17,000 artistic exhibits, has a rich working history. The Art department was separated from the Azerbaijan State Museum in 1936 and organized as an independent museum by decision of the Council of People's Commissars.